Norman Ohler investigates the murky, chaotic world of drug use in the Third Reich. There have been other books on Dr Morell’s cocktail of treatments for Hitler and Goering’s reliance on drugs, but Ohler’s book is the first to show how the entire Nazi regime was permeated with drugs – cocaine, heroin, morphine and methamphetamines, the last of these crucial to troops’ resilience and partly explaining German victory in 1940. Ohler is explicit that drugs cannot explain Third Reich ideology, but their promiscuous use impaired and confused decision-making, with drastic effects on Hitler and his entourage, who, as the war turned against Germany, took refuge in ever more poorly understood cocktails of stimulants. This chemical euphoria changes how we should think about the Nazi high command and its ability to understand the situation it found itself in by 1944-45. As such Blitzed will force a wider reinterpretation of several key events during the Second World War. It is going to be a very short review. People, this book was good. Really good. It made me see many WWII events in a quite different perspective. What’s more, it was a fun, gripping read even though the topic was rather ominous. The drug usage in Germany before and during the Second World War is a neglected part of history that needed to be told. I was absolutely amazed at the amount of drugs that Hitler consumed during the war, knowingly or unknowingly it doesn’t matter. I think it explains a lot of his irrational behavior, stupid, even absurd decisions, and his crazy outbursts of anger that he had with his subordinates. I was also amazed at the fact that so many big, powerful pharmaceutical companies, like Merck or Bayer, sold drugs freely at the end of 19th and the beginning of the 20th century – they make all the contemporary cartels look like complete amateurs! The truth is definitely stranger, and more compelling, than fiction. Undoubtedly a brilliant story! Anyone with even a passing interest in World War II needs to read this book. Anyone who wants to know whether methamphetamine/cocaine/heroin might be a temporary solution to their problems needs to read this book as well. It should be compulsory in schools. 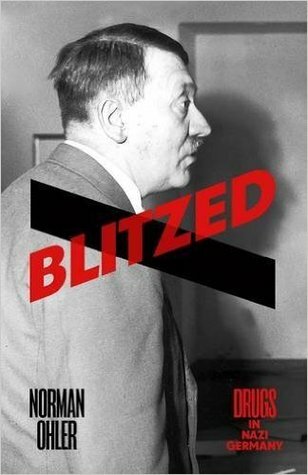 This entry was posted in book review, historical, non-fiction, one brilliant book, rating and tagged Adolf Hitler, drugs abuse, Germany, IIWW, non-fiction, one brilliant book. Bookmark the permalink. He’s definitely on something – his subordinates will tell us the truth. When he is gone.